After logging into your cPanel, the Omeka web application will generally be located under the ‘Featured Applications’ section. If not, search for it and click Install this Application. By default our automated installer will add the latest copy of Omeka to your site and keep it up-to-date automatically. We recommend you leave these settings at the default. 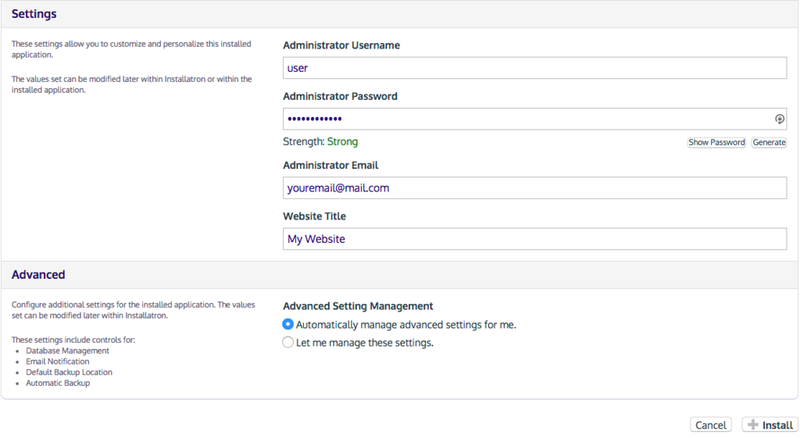 Finally, choose a username and password for the site (you can change any information automatically placed here) as well as what features you’d like enabled on your site. If you have advanced needs you can modify options under the Advanced section, but otherwise click Install at the bottom to start the installation. The automated installer will start it’s magic and get your site created for you. When it’s complete you’ll be presented with links to access both the homepage as well as the Administration area for Omeka (the Dashboard).